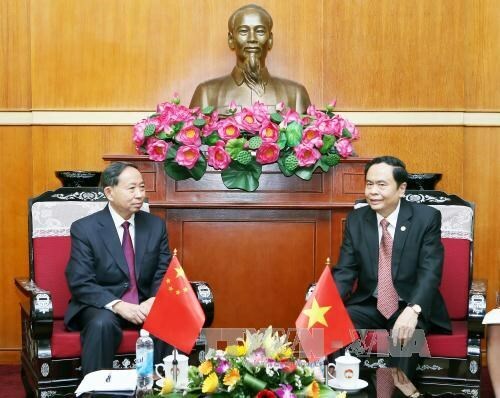 Hanoi (VNA) – The Vietnam Fatherland Front (VFF) will do its utmost to maintain and nurture the friendship and cooperation between Vietnam and China. President of the VFF Central Committee Tran Thanh Man made the pledge at his reception in Hanoi on August 25 for Yuan Guiren, visiting Vice Chairman of the International Affairs Committee of the Chinese People's Political Consultative Conference. The Vietnamese Party, State, Government, VFF and people attach importance to the cooperation and friendship with the Chinese sides, considering it a top priority in Vietnam’s foreign policy, Man affirmed. He expressed his hope that the two sides will intensify delegation exchanges, the sharing of information and experience in fighting corruption and protecting the environment, and coordinate closely in implementing collaboration programmes. Yuan Guiren confirmed that the Chinese People's Political Consultative Conference treasures and is willing to cooperate and exchange experience with the VFF in the fields of politics and people-to-people diplomacy, thus helping deepen the two countries’ friendship.